Beautiful. I love the painting – such life and humor. My heart aches for you missing him, but such lovely pieces of his heart he left you. Thank you, Cynthia. He truly did leave lovely pieces of his heart. My sympathies Jane – your tribute is beautiful. The photo is very powerful as is your prose. He’d be very proud and touched I’m sure. What a lovely painting! and such a nice easel too, The empty chair in front is a touching memorial. what a poignant post. so sorry to hear of your loss. 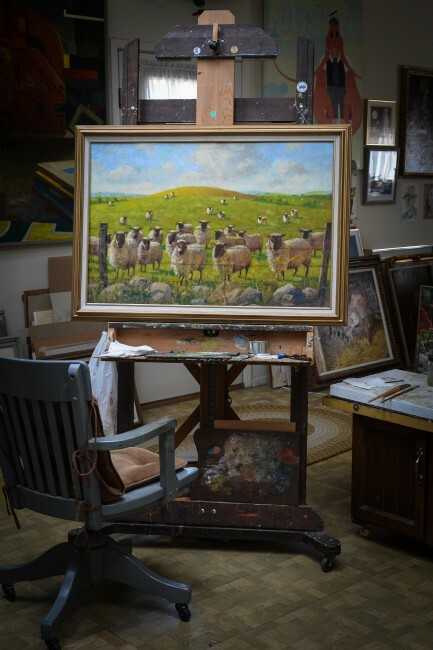 i always enjoy sheep/lamb related art & photography. this is such a beautiful piece, and the light-hearted title makes it even more endearing. how wonderful that this was presented to you. thanks for sharing. That’s a beautiful tribute, Jane. Steadfast through 91 years. Sounds that you feel blessed to have his legacy living on through his artwork. My condolences on his passing. He provided a lot of inspiration to all who knew him. Because his talents were so enduring… I think we wanted to believe he would defy time. But, that’s not the way of nature… is it? I’m sorry to hear about your father-in-law’s passing, Jane. As soon as I saw the age, I remembered your lovely earlier post about him and guessed who you were writing about. My condolences. Thank you, Dandyknife, for your kindness and compassion. He was a dear person, and a remarkably talented man. It was one of his last major pieces. Last year, when we visited to celebrate his 90th birthday, he left me speechless when he gave it to me. ❤ I feel very blessed. Jane, I am so sorry to hear of the passing of your father-in-law. As soon as I saw your comment on my blog, I had to see your tribute to your loved one. I hope that his funeral was filled with these beautiful paintings. They also bring forth the light and life of a remarkable artist. 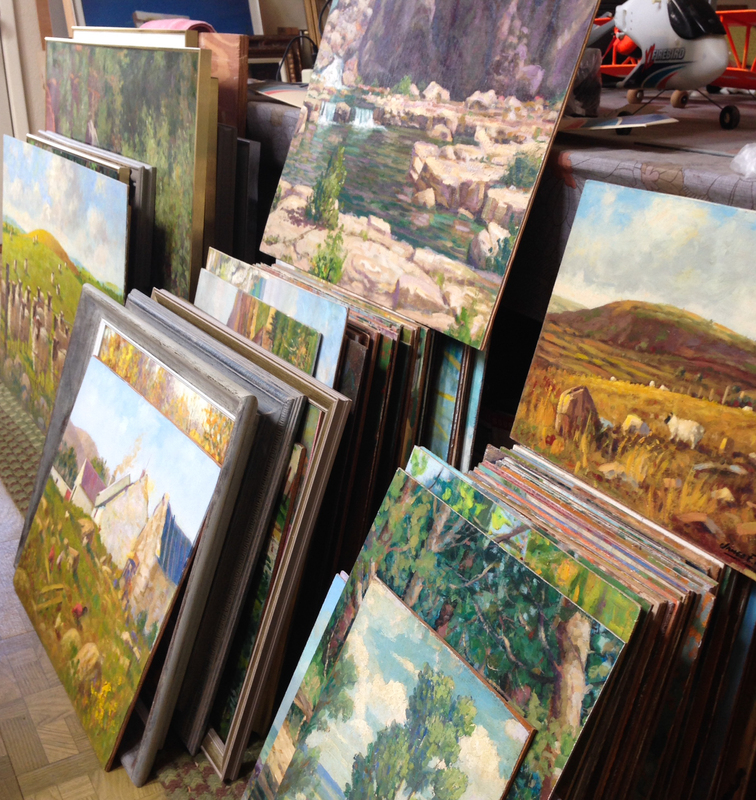 Yes, Debbie, plans are in process to select paintings that will be gracing his memorial services. Thank you for your thoughts. Take care, my friend. That would be a perfect photo for a book about him and his art. I believe you are right, Janet. The more I look at this post, the more my heart fills with his memory. The empty chair fills my eyes with tears. He was a most amazing artist… he studied at the Royal Academy in Belfast. He used techniques that are reminiscent of those used by the Old World masters. We have art genes in our family. My uncle’s a professional and well-known watercolor artist, Gerald Brommer, and our younger daughter’s at art school in Philadelphia. Seems to have passed me by, unfortunately!